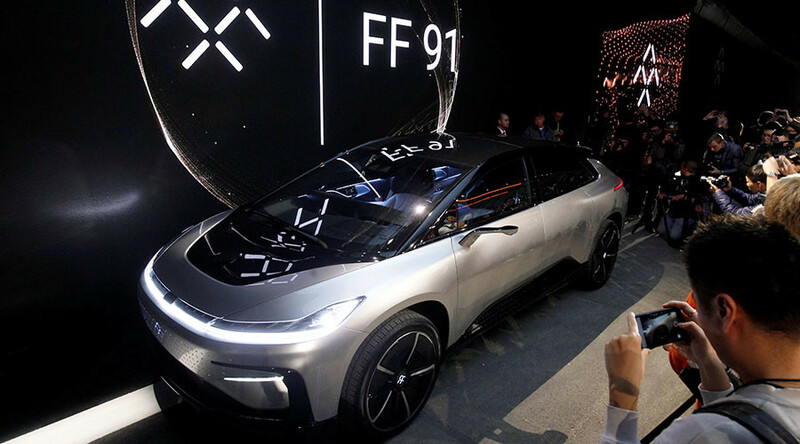 The much-hyped Faraday ‘FF 91’ e-car had an embarrassing unveiling when it failed to park itself as advertised in front of a live audience at the Consumers Electronics Show (CES) in Las Vegas. “Using the auto-valet button just press the button and it will find its way to the garage,” Nick Sampson, vice-president of engineering at Faraday, told main investor Jia Yueting in front of a crowd at the World Market Center in Las Vegas. Embarrassingly the vehicle didn’t budge. “It seems like it's a little bit lazy tonight,” Sampson said before leaving Yueting to address the audience on his own. The vehicle had successfully used its “driverless valet” function in a video shown at the event, where skeptical attendees were hoping to witness it first hand. “As a new baby, she's very very timid,” Sampson said of the glitch to The Verge. Eventually the FF 91 did slowly move across the stage. More successful at the event was an acceleration display by the FF 91, which showed off its 1,050 horsepower as it went from zero to 60mph (96kph) in 2.39 seconds – slightly faster than the Tesla Model S P100D, one of its main competitors in the electronic sports car market. The FF 91 also boasts a locking system that unlocks only when it recognises the driver's facial features. The car company says that the vehicle also has the ability to learn and adapt based on the driver's movements. Other tech innovations unveiled so far at CES include an electronic tattoo that allows the wearer to pilot a drone using just their arm and finger movements. Developed by Chinese start-up Rotex, the company claims the technology could also be used in the healthcare industry, monitoring the wearer's vitals. The CES continues in Las Vegas until January 8 with the latest tech developments revealed and showcased by industry giants including Samsung, Sony and even Lego, which is unveiling a robotics set named ‘Boost’. ‘Boost’ can create and program objects from Lego that can walk, play music – and even build Lego objects itself.